It's rare to find almost universal consensus on anything in supply chain, but we appear to be close to that with mobile robots and distribution centers. In recent weeks, SCDigest has shared bullish predictions on robots from leading analysts. 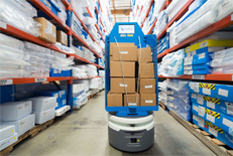 Dwight Klappich of Gartner, for example, recently predicted that over 30% of operational warehouse workers will be supplemented, but not replaced, by collaborative robots by 2023. It seems clear it will soon be I, Robot in a DC near you. Klappich note that "Next-generation AMRs are already transforming warehouse operations, as these truly become more autonomous and intelligent," adding that mobile robot costs and complexities are coming down, which opens the market to more companies to test and adopt robot technology in the DC. Then John Santagate, who runs a research service specific to industrial robots for IDC, predicted that by 2020, "65% of ecommerce operations will make use of autonomous mobile robots within their order fulfillment processes, thus helping increase productivity by over 100%." 100% improvement – that's a big number. In February, research firm Tractica predicted in that nearly 1 million warehouse and logistics robots will ship by 2022. This week, analysts at research ABI upped the ante, estimating that more than 4 million commercial robots will be installed in more than 50,000 warehouses around the world by 2025, up from just under 4,000 warehouses in 2018. However, this includes all forms of DC robots, such as automatic palletizers, not just the mobile robots considered by Klappich and Santagate. The rise in robot adoption rates will be driven by the increasing affordability and return on investment (ROI) of a growing variety of infrastructure-light robots, as well as continuing needs for flexible and efficient automated fulfillment as same-day delivery becomes the norm. Both automated guided vehicles (AGVs) and autonomous mobile robots (AMRs) are driving the growth that are directly replacing heavier mechanized automation that typically requires massive upfront investment and rigid physical infrastructure, ABI said. In addition, advances in artificial intelligence, deep learning, robot mechanics are giving robots the ability to perform traditionally harder-to-automate tasks. ABI cited manipulation robots from companies such as RightHand Robotics and Kindred Systems that can enable a wider variety of individual items to be picked and placed within a fulfillment operation. “By combining mobile robots, picking robots, and even autonomous forklifts, fulfillment centers can achieve greater levels of automation in an efficient and cost-effective way,” the research firm stated. Furthermore, robot vendors are increasingly providing flexible pricing options, especially through robotics-as-a-service models, giving companies the chance to replace large capital expense (CapEx) costs with more accessible operation expense (OpEx), giving mid-market companies adoption options they didn’t have before. What are your thoughts on major growth in robots in the DC? Why or why not? Let us know your thoughts at the Feedback section below.